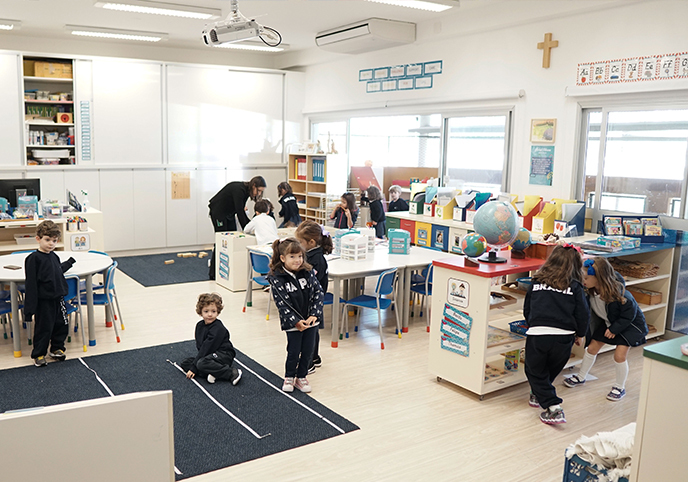 A typical day in Chapel School’s ECEC is filled with routines that support the development of social-emotional, cognitive and physical well-being. In ECEC, the day begins with a warm welcome, followed by teaching practices in which children learn by exploring, doing, and sharing. In the physical domain, care is taken including with how children eat and move. Chapel’s nutrition department works with great care and rigor in the preparation of nutritious and varied foods to teach children to enjoy different flavors. 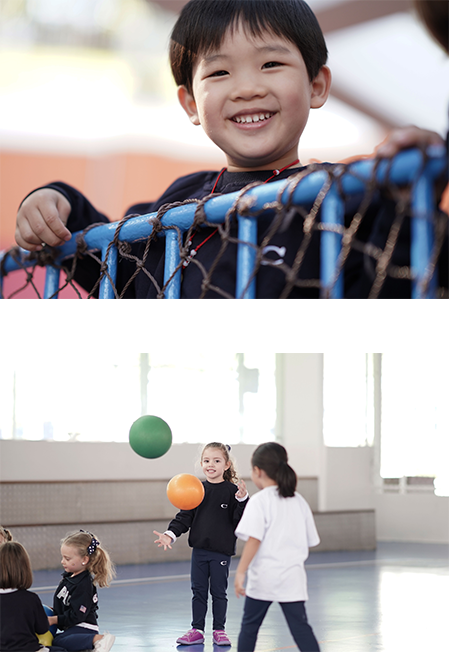 Children are also exposed to healthy living in Physical Education classes which engage them in self-awareness activities. Children learn to identify their physical strengths, be proud of their physical abilities and feel confident when playing collaborative games with friends. Playtime, includes both free and directed activities which are carefully thought out to provide opportunities to develop movement, balance, and other fine and gross motor skills. We know that children who are physically active will be more likely to take risks, explore their environment and be creative. Our pedagogical direction is rooted in social interaction and play which lead to creativity, a sense of belonging and learning. Social interaction and play are strongly connected to cognitive competence and some direct benefits include self-regulation, memory development, divergent thinking, problem solving as, language development as well as specific content knowledge. The Responsive Classroom Morning Meeting takes place every day with children participating actively. These meetings build and foster a strong sense of community, and children develop both socially and academically. Every morning the class gathers for the morning prayer, followed by a greeting, a sharing activity, a group activity and a morning message, which leads children into their daily schedule. Children also engage in daily math routines, such as counting the days on the calendar, organizing and presenting the schedule for the day, completing the weather graph, and taking attendance. Gold is an authentic observational assessment system for all areas of development and learning. This system recognizes that young children’s development is uneven, that it changes rapidly, and that development and learning are interrelated and overlapping. It is grounded in 38 research-based objectives for development and learning, and is used to guide and differentiate instruction, to collect learning evidence and to report on children’s progress. These award-winning curriculum are research-based and developmentally appropriate. They are fully aligned with the Head Start Child Development and Early Learning Framework, which uses exploration and discovery as a way of learning. 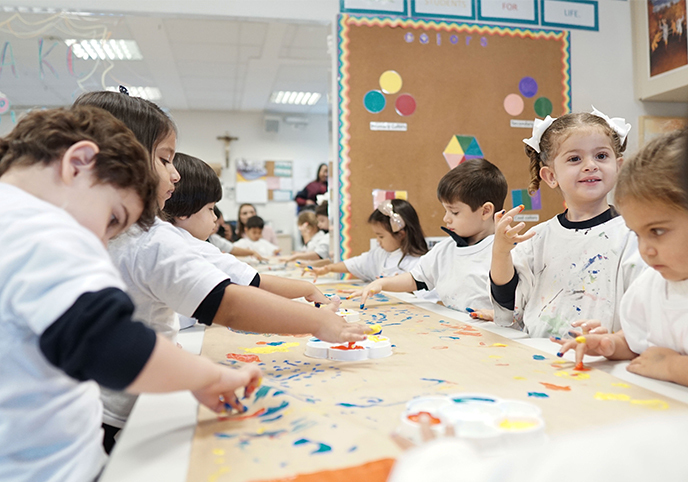 The Creative Curriculum and the All About Preschoolers Curriculum support children to develop confidence, creativity, and lifelong critical thinking skills while exploring interdisciplinary studies that include, language, math, social studies, science, music, arts, and physical education integrated activities. Math concepts are taught through playful and engaging hands-on experiences using real world examples, manipulatives, games, and other tools. 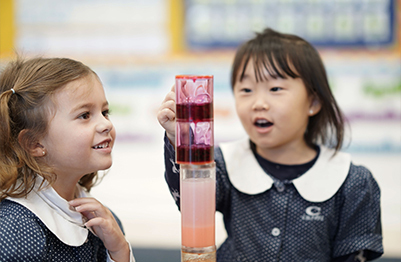 Through the essential processing skills of problem solving, reasoning, communicating, making connections, and representing, children learn mathematics content and build reasoning skills. The Being A Writer Program begins in Kindergarten, and through collaborative practices children listen to stories and discuss good writing. They share their thinking and listen to the thinking of others, and are introduced to developmentally appropriate writing conventions. Children develop both socially and academically as they build their knowledge and love for writing. Visual Arts education is based on elements such as line, color, shape, texture, value, shape, and space. During classes, students are exposed to different techniques and materials that provide opportunities to create their projects in various mediums (painting, sculpture, drawing and collage). In addition, the Chapel Art Collection and The Chapel Art Show are used to further enrich classes. The Chapel Art Collection allows students to appreciate and learn from the real art in which they are surrounded. During the Chapel Art Show students participate in guided tours and workshops as well as go to art exhibits outside of Chapel. Music education at Chapel is rooted in the philosophy of learning as a process whereby students have the opportunity to develop his or her musical abilities by exploring elements and movement. Children have multiple opportunities to learn about the history of music and enjoy to different genres, composers, musicians and performers.